Pacific Engineering and Production Company of Nevada (PEPCON), a former subsidiary of the American Pacific Corporation (AMPAC), formerly manufactured perchlorate-based chemicals from 1955 to 1988 at the Henderson, Nevada location. May 4, 1988, Clark County, NV: According to NASA: 'What began as a normal repair procedure at the Pacific Engineering Production Company of Nevada (PEPCON), a chemical plant specializing in the manufacture of a major component in solid propellant, ended in the worst way imaginable. While many workers were leaving for lunch, sparks from a repair crew welding torch set ablaze fiberglass infrastructure. The flames, which grew out of control, soon engulfed PEPCON's massive stock of oxidizer, creating the largest domestic, non- nuclear explosion in recorded history. 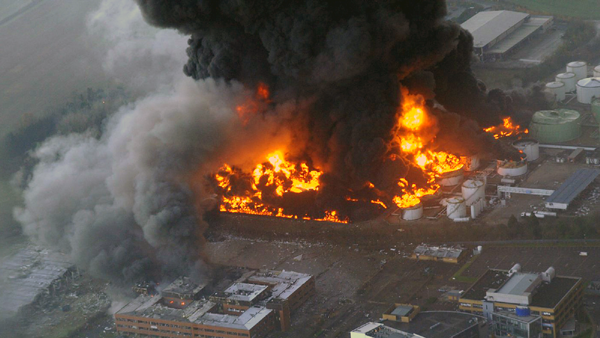 The explosion affected structures in a 10-mile radius, accrued damages estimated at $100 million, injured approximately 372 people, and ended the lives of 2 plant employees.' The PEPCON plant was one of only two American producers of ammonium perchlorate "AP," an oxidizer used in solid propellant rocket boosters, including the Space Shuttle, military weapons (SLBMs launched from nuclear submarines), (Atlas, Minuteman, Patriot, Polaris etc.) programs. The other producer, Kerr-McGee, was located less than 2.4 km away from the PEPCON facility, documented GAO. Analysis of the Accidental Explosion at Pepcon, Henderson, Nevada. 87185 and Livermore, California 94550 for the United States Department of Energy May 4, 1988. GAO: Solid Rocket Motors: Loss of Oxidizer Production Necessitates Emergency Procedures, 1988 . National Aeronautics and Space Administration: System Failure Case Studies - Fron Rockets to Ruins. November 2012.